The archive is still up and running today and more videos are added regularly. 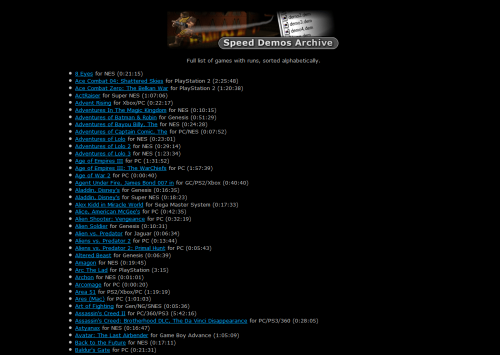 The list of speedruns is extensive and covers all kinds of platforms. Examples are the Atari 2600, Dreamcast, NES, Neo Geo, Playstation and the PC. Whether you are into RPG’s, shoot’em up’s or racing games, I’m sure you’ll find some videos to enjoy. You’ll find the complete list of speedruns by clicking here. One guy managed to beat Super Mario World in about 10 minutes. I didn’t even know that was possible! How about the legendary Fallout RPG from Interplay? Completed in 6 minutes and 54 seconds.. these guys sure got some serious gaming skills. I’ve embedded another example for you to watch. It is a speedrun of Super Mario Bros 2 by Andrew Gardikis. He managed to finish the game in 9 minutes and 15 seconds. 😀 Have fun! I’ll definitely check out the Speed Demos Archive further in the future. It’s great fun watching the videos and also educational (one can pick up quite a few tips and tricks!). If you’re into games, I highly recommend that you pay the site a visit. That was pretty cool! Especially the Mario 2. Too bad Nintendo released a non-Mario game for Mario 2 outside of Japan because they felt the actual sequel would be too difficult, but then released it on Lost Levels for SNES years later. Thanks for commenting. 🙂 I agree with you. Wasn’t Mario 2 based on Doki Doki Panic? Remember reading something about that. Yeah, it was Doki Doki Panic, but they changed the sprites. OK, thanks. 🙂 I think my favourite Mario platformer is Super Mario World. That one rocked. For me it was Super Mario 3 (AKA Super Mario 4 or Tanuki Mario, whatever it is called). Just for the fact that it was the one Mario game that I spent hours upon hours playing as a kid and have beaten a couple of times. Just watched the DKC speed run. Highly impressive to watch and the guy who posted the speed run added lots of notes about the techniques used in the various levels. Some interesting glitches in the game – such as the roll jumping one on the Mine Cart Madness level. There is a similar archive out there for the ZX Spectrum, while it’s not focused on speed runs it is interesting to watch the games being completed. The vast majority of the play through’s in the archive are in ‘RZX’ format designed to be played back on a compatible emulator but quite a lot are also available as YouTube videos (ALL of the ‘distribution denied’ stuff such as all Codemasters games). I didn’t know about the ZX Spectrum archive, so thanks for the heads-up. Will definitely have a look at that one. 🙂 Seems like the ZX-scene is very active and alive in 2012! Go Spectrum! Glad to hear that you enjoyed the post. 🙂 Thanks!